Review current Jeep rental rates. Why Rent a Jeep on the Big Island at Kona or Hilo? Jeeps are fun! They provide an exciting ride. Island roads aren’t always the smoothest, but a 4X4 Jeep will crawl over them in high style. Jeeps are perfect for the lower speed limits surrounding Kona and Hilo. They’ll get you to your destination as quickly as full-size vehicle with lots of horsepower. 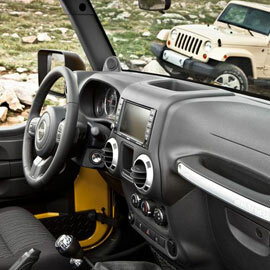 We now offer 4-door Jeep Wrangler Unlimiteds that are an extra bonus for up to 5 passengers. Getting in and out of a 2-door Jeep can require some squeezing. Our 2-door Jeeps are provided with soft tops. They can be removed, but be sure to allow extra time at the end of your vacation to replace the top as it was when you initially rented it. (they can be a bit tricky to snap back on) This is not a touch-of-a-button convertible. Because the tops are cloth, we emphasize that you leave nothing in your vehicle when it’s unattended. If you do leave an item of no value, we recommend you place it in plain sight so that it won’t appear “collectible”. Technically, a Jeep makes sense. If you pull to the side of a road or take many of the secondary island roads, a Jeep’s 4-wheel drive and elevated clearance make this the ultimate sport utility vehicle. Additionally, its small size and tight turning radius are a great bonus when maneuvering tight parking areas. For those who want the Jeep experience, but would prefer easier road handling, we suggest an SUV of your choosing. As with all our Jeeps, air conditioning is included. You won’t find a 2-door or 4-door Jeep’s cargo area to be very spacious. Expect the ride from the airport to your lodging to be cramped, unless you travel light. That said, once you get the luggage out and are ready to explore The Big Island, your Jeep will provide the fun you came here for.